ROCHEFORT-SUR-MER, France -- The French man who had the world's first double-hand transplant will meet the French woman who just had the first partial face transplant. 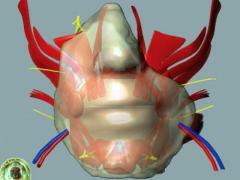 A 3-D model shows the reconstruction of nose, lips and chin in the world's first partial face transplant, which was performed last month on a French woman. Denis Chatelier has lived for six years with new hands. He said he'll congratulate the woman and offer her encouragement when they meet next week. He said he'll warn her of the hardships ahead, but also let her know that later in life "she can be happy." He also said he'll mention the swarming media attention and stares she'll get. And he want to prepare her for a lifetime of potent antirejection drugs, many of which have left him vulnerable to illnesses. Chatelier's forearms were severed in 1996 by an exploding model rocket. The woman was disfigured when her Labrador mauled her.